I often scan documents and send them out as PDF, and there have been a few instances where the pages are not properly oriented. I realized that was a real problem when a few people asked it on Reddit. There are PDF editors which allow you to edit your PDFs but I don’t think anyone who doesn’t regularly works with PDF would want to commit to an Adobe subscription just to rotate a few pages. I have compiled a list of tools that allow you to rotate you to for free. These methods are quick and we’ll cover all the platforms. Let’s get started. Most of the following programs makes batch changes to the PDFs, and often lacks undo button. So, it’s always a good practice to make a backup copy of your PDFs before you start editing it. Windows 10 has an inbuilt browser known as Microsoft Edge, which unlike the popular belief is quite powerful. 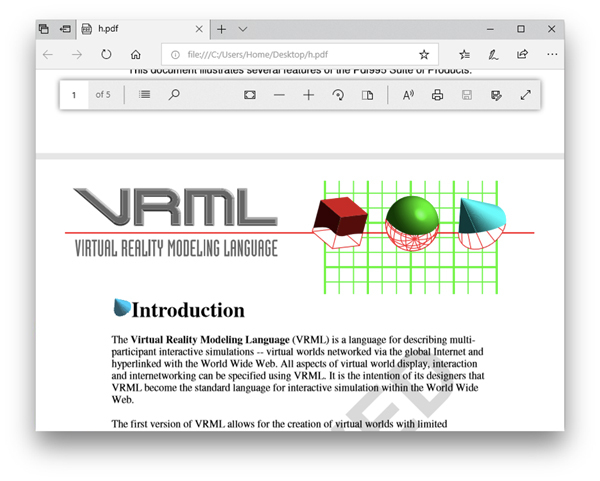 You can read PDFs and even rotate the pages on Edge browser. To open a PDF file in Microsoft Edge browser, Right-click on the PDF file and select ‘Open With‘ from the drop-down menu and choose ‘Microsoft Edge‘. It would open the file on the browser and you’ll see controls on the top of the page. To rotate the PDF, just press the rotate button on the toolbar until the pdf is upright. You can’t save the files after rotating it. 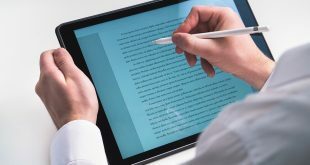 So use this method when you just have to read PDF, but if you wish to edit and save PDFs, the next tools in the list are going to help you with that. If you are not running Windows 10 (which you should), you can use PDFSAM, an opensource PDF editor which does the basic functions like edit, split, merge, and rotate. It does have a paid version which offers more functionality but if you just need to rotate pdf this is a great tool. Its free, quick and also handles multiple PDF for batch processing. Installing the program should be very easy and you can just follow the instructions and when its done run the program by clicking the icon on your desktop. 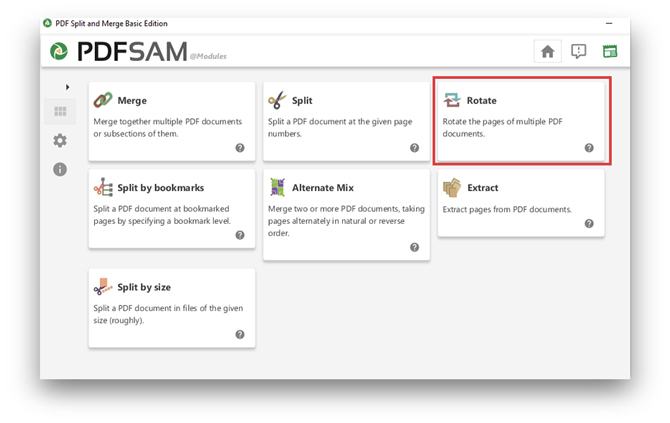 Once you open PDFSAM, you’d see a few options, click on ‘Rotate‘ to load the window. You can add multiple files here by clicking ‘Add‘ and specify individual pages which you want to be rotated by entering the page numbers in the Page Ranges field. For example, out of 10 pages in the PDF file, you only want to rotate, page number 1 and 2. You will have to write down the numbers somewhere because it doesn’t have a preview option where you could see the progress. The page Ranges option on the right, you can enter the page numbers separated with a comma and then choose the rotating angle. Mind you, its a batch process and it would make changes to all the PDF files you’ve selected. After you’ve set the angle for rotation for pdf then you need to specify a directory or leave it default (which is the original file’s directory). 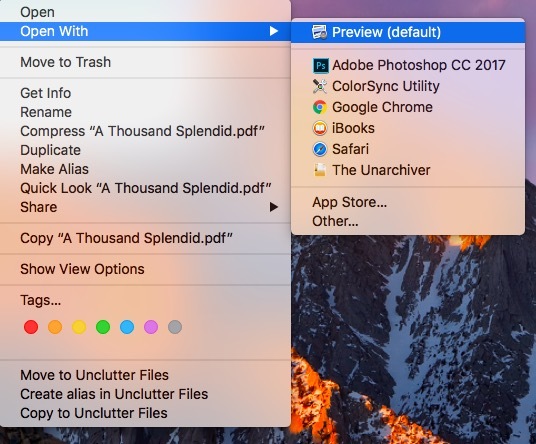 To keep the file names separate and avoid confusion, you can add a prefix before every pdf file with File name settings and then click on Run. The bar on the bottom shows progress and after its done, your files are saved in that directory. You can check for the rotated pages by clicking ‘open‘ button. This method works great for processing a large number of files on Windows but if you use smartphones there are methods for that as well. Unlike Windows, the basic functionality for editing PDF’s is built into macOS. The Preview app has an inbuilt feature which displays PDFs and lets you rotate individual pages of a PDF file. 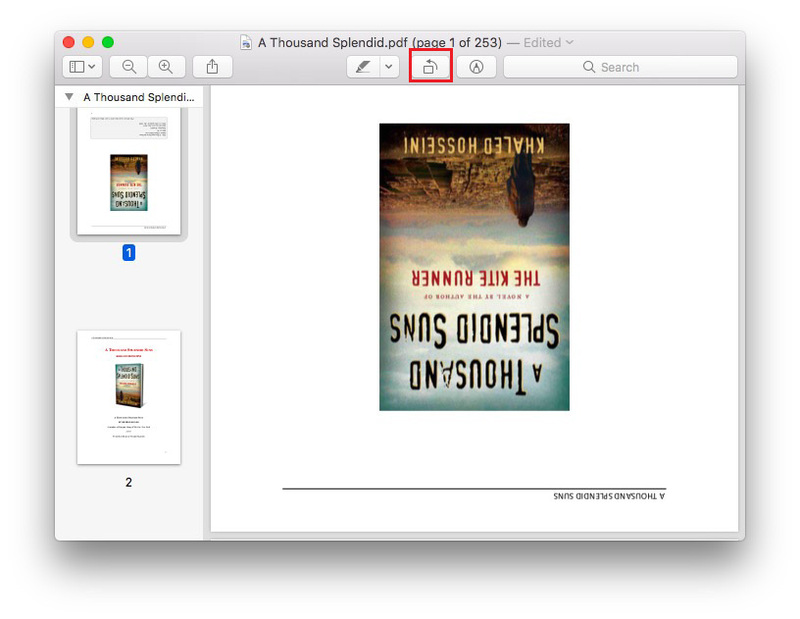 To rotate a page in the pdf open the PDF file with the preview app by right-clicking the file to open it in Preview. Preview mode is generally used to preview files but you can rotate individual pages with it. To rotate a page of your choice, select the multiple pages while holding down the Shift key. Next, click the Rotate button on the toolbar (highlighted in the red box below), if the rotate buttons do not appear in the toolbar, click on the Tools option in the menu bar and select Rotate Left or Rotate Right option. It changes the orientation of the page but you have to save the changes first. 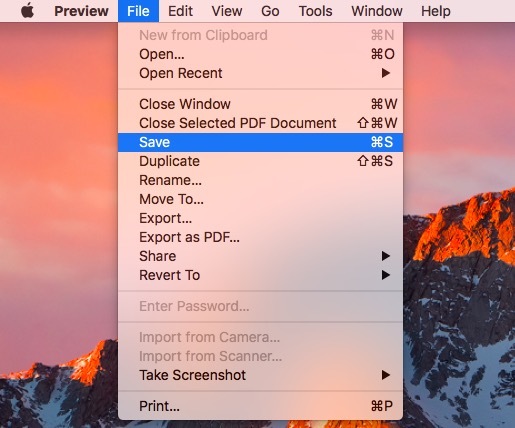 To save the document click on ‘File‘ and select ‘Save‘. This would retain the new orientation of the page and open your files with the correct orientation. One quick google search offers plenty of free tools which offer PDF rotation. 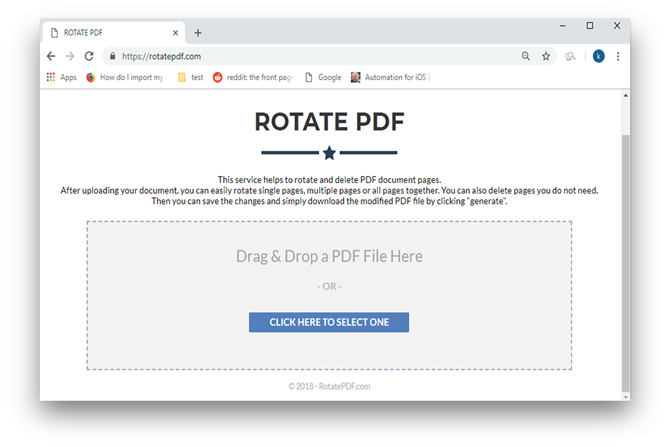 I chose rotatepdf.com because it’s quick and efficient and doesn’t prompt me to sign up. It even has the ability to rotate individual pages. To rotate your pdfs on the web, go to rotatepdf.com and you’ll see the screen just like in the image below. You can drag a file from your system and drop it on the box or select it manually by pressing the button ‘Click Here to Select‘. After you choose a file, mind you it can process only one file at once and it might take some time to upload depending on the file size and your internet connection. It usually uploads fairly quickly. Once the file is uploaded, it lists all the pages with a thumbnail and with a dedicated rotate and delete button for each page. 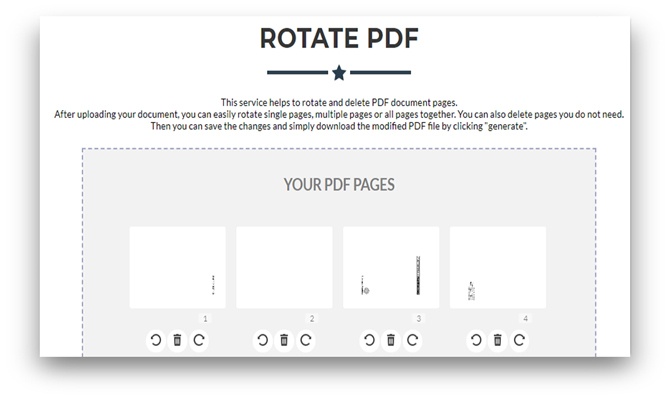 You can rotate individual pages by pressing the rotate buttons. If there are duplicate pages you can delete those pages by tapping the bin button under the page. After you’ve rotated all the pages, Press the Generate PDF button and it would download the file to your system. 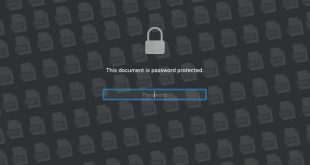 This method is quick and easy but again, many people refrain from using the third party online tools because there is always a risk of those servers collecting your data. 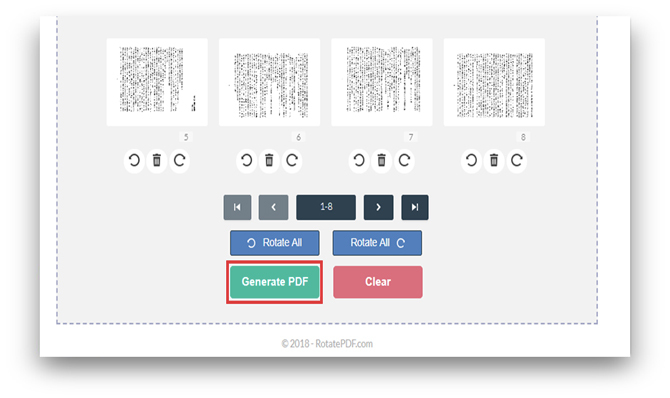 So, if your data is confidential and important and can’t take a risk, there are other methods which you can use like downloading a free tool to rotate pdf. 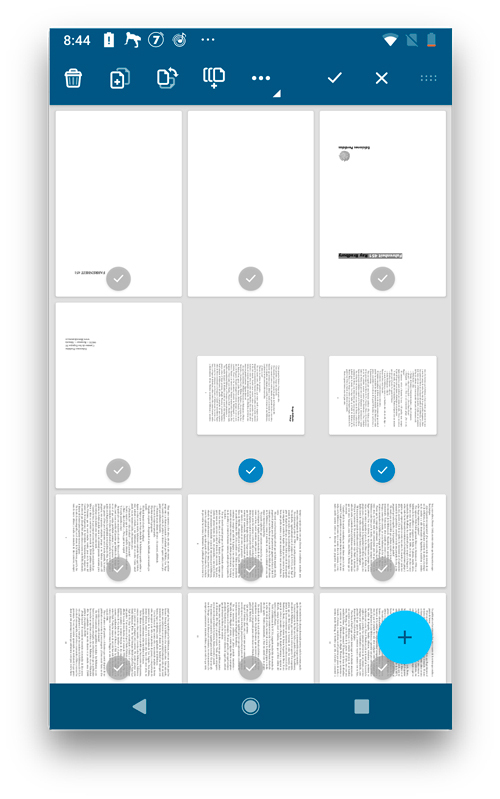 There are a plethora of PDF editors for Android, offering features ranging from annotation to rotation. You can choose any of the free apps and use it to rotate the pages of pdf files. I chose PDF Viewer which gets the job done fairly quickly and you can choose individual pages to rotate. 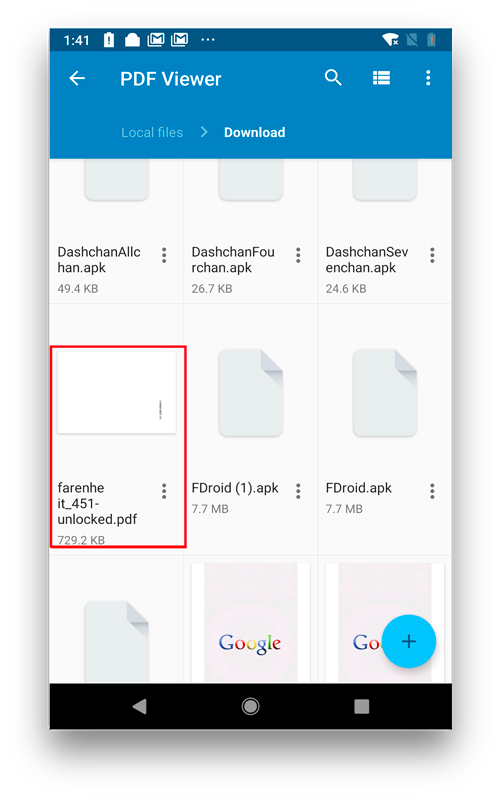 Install PDF Viewer from the Play Store and open it. Select your PDF file from the directory and tap the icon to load the file on to the app. 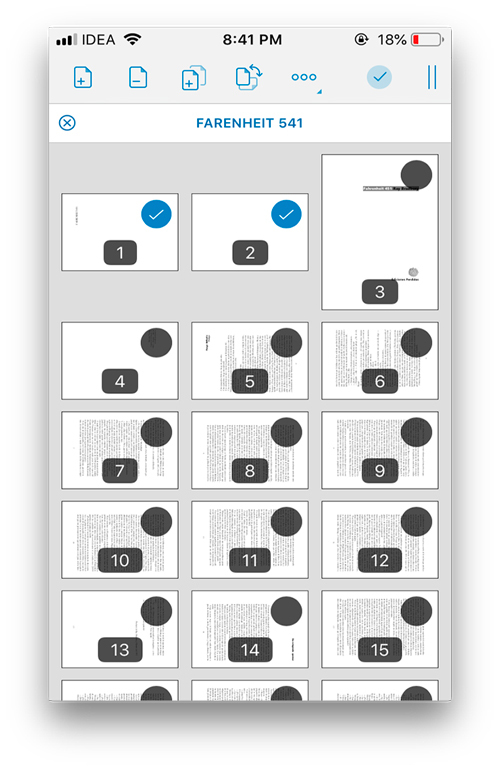 Once the pdf is loaded you would see the default view, you can’t edit the files in the view mode and to rotate the pages you need to switch to thumbnail mode by tapping the thumbnail icon on the top right. It brings out the editing tools. Select the pages by long pressing on the page number. You can select multiple pages and after all the pages are selected, tap on the Rotate Button until the pages are in the correct orientation. 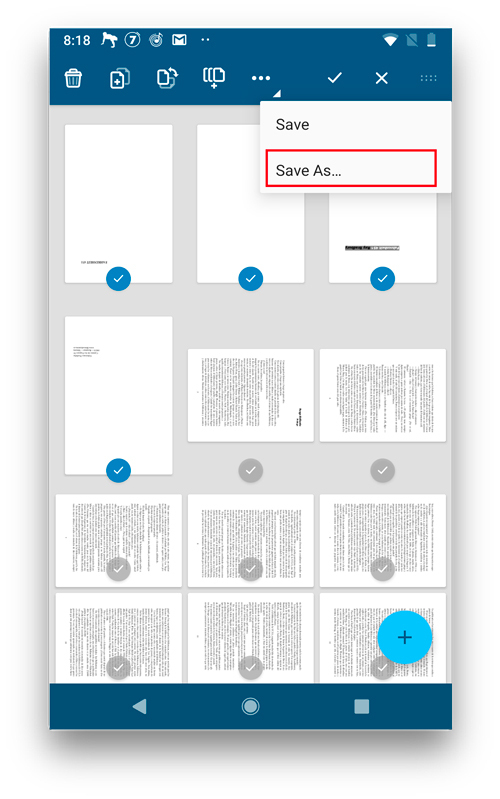 Now, save the pdf with pages in the right orientation, tap on the ‘Check Mark‘ button and select ‘Save As‘ to save the file on your phone. 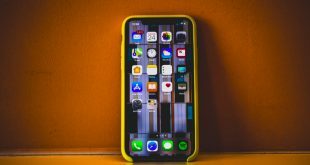 This app works great and if you use an iPhone and need to rotate your videos then you can use this app to rotate pages on iPhone and iPad as well. PDF Viewer works for both Android and iPhone and to rotate the PDF files you need to follow the exact same steps. Why not choose another app? Well, I looked up on the App store and most of the apps were paid and the free ones weren’t as good. PDF Viewer is both free and quick to use. 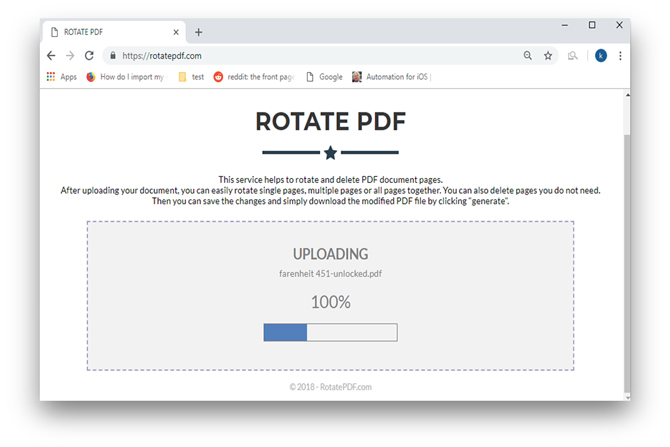 Let’s see how you can rotate your pdf files on your iPhone and iPad. 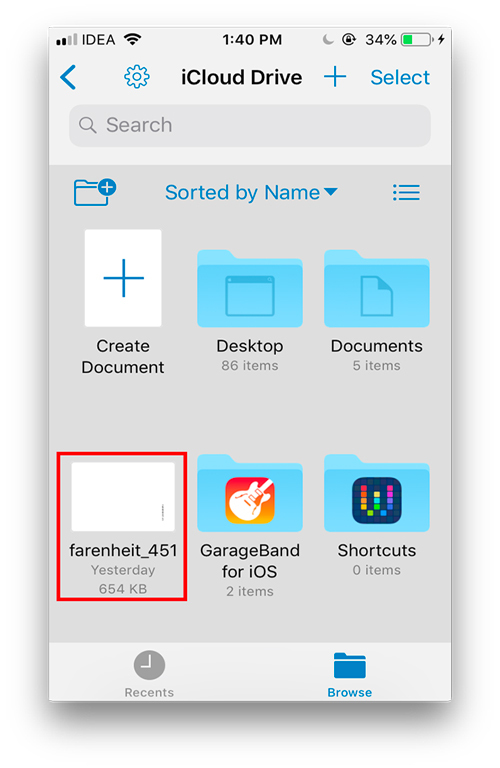 Install PDF viewer from the App store and open it, select the PDF file from Files ( iCloud folder) and tap the file to load it on the app. 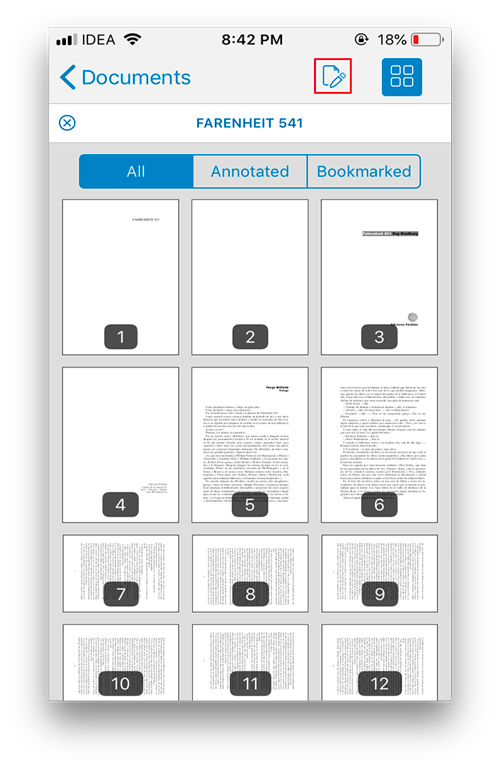 On the top right corner of the app, you’d see a thumbnail view and an edit icon, to rotate pdf files tap the edit button. You can select all the pages which are out of sync or orientation and press the rotate button on the top until the pages are in the correct orientation. 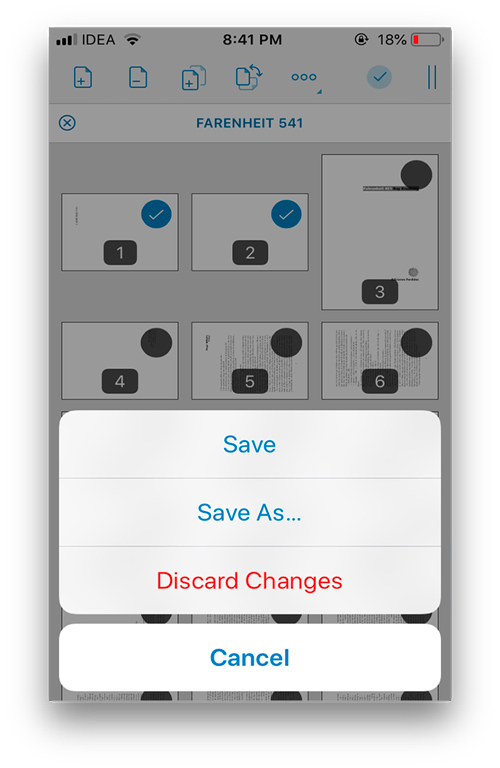 Once your pages are fixed you can save the file by tapping the check mark button to save the files to your iPhone or iCloud folder.